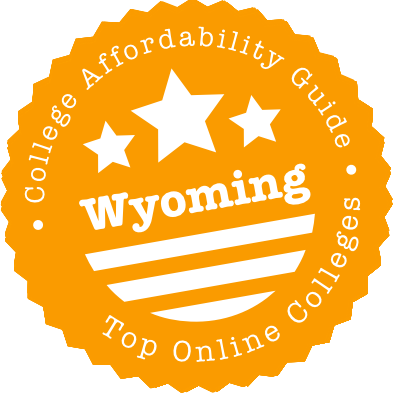 Scroll down to see the top not-for-profit colleges and universities in Wyoming offering online degree programs. University of Wyoming offers eight Bachelor degrees, twelve Master's degrees, and four doctorate degrees including bachelor degrees in applied science, business administration, criminal justice, family & consumer sciences: professional child development, nursing: accelerated, nursing: RN/BSN completion, psychology, and social science; Master's degrees in education: curriculum and instruction, education: instructional technology, education: special education, educational administration: adult and post-secondary, educational administration: K-12 educational leadership, English, business administration, family & consumer sciences: human development & family sciences, kinesiology and health, nursing: nurse educator, public administration, and speech-language pathology; as well as doctorate degrees on educational administration: adult and post-secondary, educational administration: K-12 educational leadership, EdD in education: instructional technology, and nursing practice. The same financial aid is available for online students as it is for on campus students: scholarships, loans, and grants. Students can complete coursework whenever it is convenient, and most classes will not require students to be online at specific times. However, classes will have deadlines and exam dates, and some classes may require proctored exams. Western Wyoming Community College runs eight online associate programs plus an additional four certificates. These run the gamut from computers to accounting to social work and sociology._But WWCC doesn't stop there. Via the Wyoming Distance Education Consortium, students outside its fully online programs can search for and request to take distance education classes from the University of Wyoming and six other state community colleges. WWCC also partners with UW and a further eight universities to help graduates easily transfer into those schools' online baccalaureate programs. Laramie County Community College has nine associate degree programs and six certificate programs that students can complete online. About half the associate degrees are Associate of Applied Science degrees in fields such as health information technology, computer information systems, and cybersecurity that are designed for students who want to focus on job skills. The rest are Associate of Arts or Associate of Science degrees designed to provide students with the first two years of classes for a four-year degree. LCCC has transfer agreements with four-year schools that make it easy for students to transfer their credits to a bachelor's program. All the certificate programs cover business skills such as web design, medical coding, or entrepreneurship. Wyoming is the least-populated state, but its public university and community colleges present plenty of options to online students. And due to the state’s common course numbering and easy transfer system, they work so well together that you may not know which school to attend. That’s where we come in. We’ll show you how to get a free year’s worth of college education online, spell out your transfer options, and point you to tuition exchange programs that can save you money. We’ve packed a lot of information in this guide, but don’t worry! We’ll recap with a list of links at the end. A combined initiative of Wyoming’s eight public colleges and universities, WyCLASS helps you “find the classes you need.” To get started quickly, search the course directory for classes delivered via synchronous modes (e.g., interactive television and teleconference) and asynchronous modes (e.g., internet). A lot of states have this type of directory, but Wyoming’s does something nifty. It lets you select the courses you want to take, then check out. That allows you to send a registration request directly to the schools offering the courses you’ve selected. Each college will contact you to complete the registration process, not the other way around. The state’s Dual and Concurrent Enrollment Program lets Wyoming high schoolers earn college credit by enrolling in state community college or University of Wyoming classes. Though most courses are taught at high schools, colleges or college outreach centers throughout the state, many dual enrollment courses are available online. You’ll find them at Wyoming Switchboard Network. Eligible students can take up to 32 college credits — or about a year’s worth of college — online without paying a cent. Students at the state’s two online K-12 schools, Wyoming Connections Academy (WYCA) and Wyoming Virtual Academy (WYVA), are particularly well-positioned for dual enrollment courses because they’re already learning online. First, the Western Undergraduate Exchange (WUE) allows students from participating states, such as Wyoming, to enroll in eligible programs at colleges in other WICHE states at a discount. Or vice versa. Second, the Western Regional Graduate Program (WRGP) provides a similar opportunity for graduate students, except in this case students attending participating programs receive more than a discount — they are charged the same low price as residents. Last, while WICHE isn’t exclusively for distance learning, the Internet Course Exchange (ICE) is. Though mostly a tool for administrators and faculty to open up class spaces to students at other colleges, having ICE work in the background makes it a bit easier to access online degree programs. If you want to get an online degree from University of Wyoming but it doesn’t have the courses you want, don’t fret. Wyoming’s community colleges and the flagship university work together seamlessly. First, the community colleges and the University of Wyoming utilize common course numbering. So, for example, History 101 is the same across all schools. Second, the Wyoming Transfer Advance guarantees admission to UW if you’ve earned an associate at a state community college. It also guides you through a 2+2 process so you can graduate in four years. So feel free to rack up online courses at the community college level before transferring. Last, if you didn’t follow 2+2 but still want to go to UW, you can use the UW Transfer Equivalency Self-Service. Type in the degree you want, enter the courses you’ve taken, then see how those credits will be applied and which courses you still need to take toward your UW degree. In 2018, no school in Wyoming met our tough criteria on quality and affordability. That’s not so odd, considering Wyoming is a small state. (We should point out that the University of Wyoming has appeared here in the past). If you’re looking at more expensive options, and don’t know if the price is worth it, check out College Scorecard. It’s a government-run site that keeps tabs on graduation rates, student debt and alumni earnings. Given the paucity of colleges in Wyoming — traditional or otherwise — it’s fairly easy to check a school’s accreditation status and make sure everything is in order. Plus, all the schools offering online programs are public, and state schools seldom run afoul of accreditation standards. The Higher Learning Commission, an accrediting body of the North Central Association of Colleges and Schools, is the regional accreditor for all degree-granting colleges and universities in Wyoming. Find accredited Wyoming institutions on its website. For more in-depth coverage of each school’s accreditation status, click on its name, especially if any Public Disclosure Notices pop up. These may indicate the following negative actions (in order of severity): notice, probation and show-cause. To double-check that an institution is accredited, you can use the Council for Higher Education Accreditation (CHEA) Database, which also includes nationally accredited schools. If the school you’re looking at isn’t on this list, it’s probably not a real school (or it’s still in the process of applying for accreditation). The CollegeAmerica chain maintains a Cheyenne campus to complement its online offerings. Although CollegeAmerica is accredited by the Accrediting Commission of Career Schools and Colleges (ACCSC), a national agency, there’s some dispute as to whether it’s a for-profit or nonprofit college. The Century Foundation criticized its parent company, the Center for Excellence in Higher Education, in a 2015 report, The Covert For-Profit, suggesting that its request to convert from a for-profit were designed to enrich one man while bypassing regulations meant to protect students. The U.S. Department of Education denied the request. CollegeAmerica Cheyenne has also had recent run-ins with its accreditor since 2012, when a former director blew the whistle to ACCSC on the chain’s practices. ACCSC issued a show-cause directive (essentially, a threat to pull the schools’ accreditation) in 2014 related to poor student outcomes and then placed it on probation in 2015 for low job-placement rates. Higher Learning Commission: The HLC is the regional accrediting body for Wyoming’s degree-granting community colleges and four-year university. UW Transfer Equivalency Self-Service: The website is quick to note that it doesn’t produce official results, only evaluations. But it’s still useful if you’re moving from a Wyoming community college to University of Wyoming. Enter the credits you have and the degree you want to apply them toward. The application does the rest, showing you what courses you need to graduate. Western Interstate Commission for Higher Education (WICHE): The Western Undergraduate Exchange and Western Regional Graduate Program are two tuition program exchanges that can save you money — if your degree is offered online at a participating school. Wyoming Community College Commission: If you’re getting an associate degree via distance education, this website can save you some time. Most of the links to individual schools work, and the site also connects to information on dual and concurrent enrollment. Wyoming Connections Academy (WYCA): WYCA is one of two free public virtual schools in the state. It’s open to all Wyoming residents from kindergarten to high school age. Students can benefit from Advanced Placement (AP) courses, which can lead to college credit. Wyoming Transfer Advance: By showing how to most efficiently plan your schedule, this resource helps you map out a path to a UW degree while you’re still in community college. Wyoming Virtual Academy (WYVA): Wyoming Virtual Academy is the state’s other free public virtual school. It’s also open to all Wyoming residents from kindergarten to high school age, and features AP classes and other dual enrollment opportunities. WyCLASS: Through this resource, you don’t have to settle for finding courses online. You can request registration for upcoming distance education courses across multiple campuses with a few clicks of a button. Wyoming Switchboard Network (WSN): WSN is the central repository for free online classes available to Wyoming’s K-12 students. Some of the courses in the catalog are offered by high schools for secondary school credit, while others provide dual enrollment opportunities through the state’s community colleges.